1) It provides a point of reference for the management when resolving legal issues. 2) It keeps a business on the right side of the law in terms of adhering to federal and state regulations. This minimizes chances of a business having to pay penalties or losing their reputation because of violating regulations. There is no such thing as a one-size-fits-all program. Rather, businesses create one in adhering to broad diverse guidelines laid out by the federal government. There are guidelines for retailers, suppliers, human resource managers, and other types of businesses. 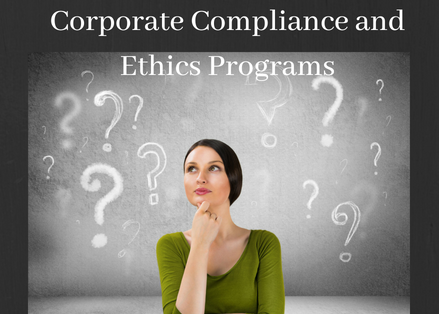 The seven elements of an effective compliance and ethics program. Businesses create programs following The Organizational Sentencing Guidelines which is issued by the U.S Sentencing Commission under the direction of Congress. The guidelines stipulate seven elements that must be included in an effective program. Businesses are required to have in place procedures for the prevention and detection of criminal conduct. These should be communicated to all employees clearly. Businesses have to give a particular senior executive or a committee of executives the responsibility of compiling a program. However, its implementation is the responsibility of a governing authority. This is typically the board of directors. Another element of an effective program is that those with substantial authority in a company do not act unethically or engage in criminal activities. If they do, it is expected that a company will make reasonable efforts to curtail their authority and chances of misconduct in future. A business must have a program that not only looks good but that is fully implemented through education and training programs. Employees need to be trained on a company's protocol in respect to correct accounting procedures, employee harassment claims, accepting gifts and favors, dealing with customer complaints and other scenarios and grey areas that could arise. A company is required to edit its audit program to evaluate its effectiveness and ensure it is being actively implemented. In addition, a company should give employees the means to make anonymous or confidential reports such as against a superior who is breaking the rules. Such reports should always be investigated and seen to conclusion. Every business should give its staff incentives to comply with a program. This is done by taking action against those who defy it. This gives it credibility. A company has to address every incident of defiance against the program regardless of the position of the perpetrator. Additionally, measures to prevent similar incidents should be taken. Under U.S federal law, a business is liable for wrongful acts committed by its employees. If this happens, an effective compliance program would go a long way towards minimizing the penalties the company will face. You can get it right by engaging a team of counsel and industry experts. They will craft a customized compliance and ethics program and ensure that you have a program that is compliant with every federal requirement.